Following the previous blog (see blog post Face Tracking 3), where I have stated that one I wanted to redesign the circle, to have more than one circles to make it more of a community installation and to stop the circle from becoming broken when more than one face is detected and thirdly to create the particle system, I have solved two of these problems. 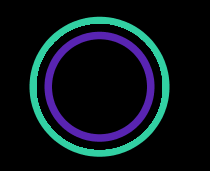 The first problem that I have solved is the redesign of the circles. As seen below I have firstly changed the background to black, this is because it makes the colours stand out. Secondly I have created a ring design for the main object. This is because through some testing I found that having a randomly changing coloured whole circle is far to much to take in and does actually start to mess with peoples eyes. I had began to test it without a randomly changing background however that seem visually to boring. Through some redesign I started going down with the idea of a ring design where the would be less surface area of the circle coloured, in the hope that it would make the randomly changing ring stand out a lot more. I found that just one ring was not really enough to make a visual statement, however the introduction of more rings does. I settled on just having the two rings because I felt having more would be to distracting to the particle system that will be made. The second problem that I have fixed is the introduction of more than one circle. 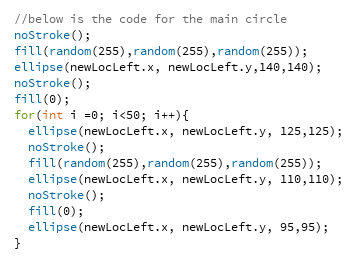 This was actually a simple fix as placing the code which designs the circle within a FOR loop, which can be seen below, means that for every face it detects another circle is drawn and follows a specific face. Video showing that the installation now supports more than one user. In terms of the final problem that I have to complet within this project, which is creating a particle system, I have been nudged in the direction of finding particle systems created by Daniel Shiffman, by my lecturer. This is a route I will look at because my attempts at creating a particle system thus far have been monumental disasters.